Owen Turtenwald competing at Magic in 2018. On Wednesday, one of the most prominent players in the Magic: The Gathering scene was unceremoniously dropped from this weekend’s first-ever $1 million tournament for the strategy card game. Since then, as questions have been raised about the unspecified reasons behind Turtenwald’s removal, sources have told Kotaku that the player has engaged in inappropriate behavior toward female players and fans for years. Owen Turtenwald has been ranked among the world’s top Magic players for about a decade. In 2011, he won a string of seven Grand Prix tournaments, earning that year’s Player Of The Year award, which he won again in 2016. 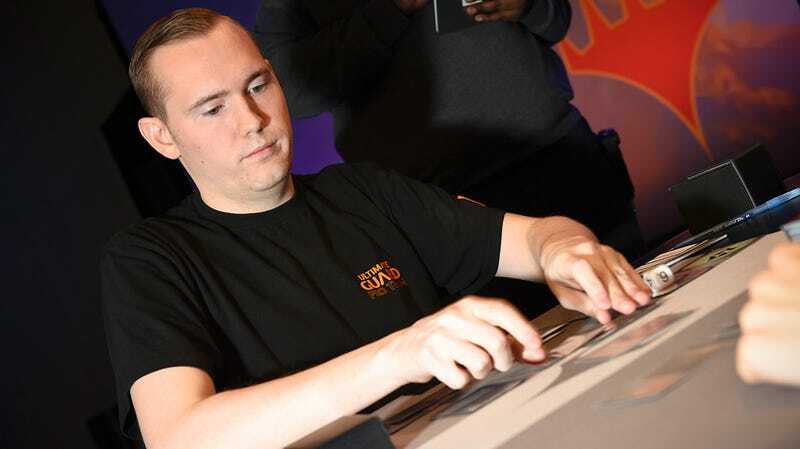 Today, Turtenwald is a celebrated member of the Magic: The Gathering Hall of Fame, a sponsored Twitch streamer, and a competitor in the Magic: The Gathering’s 2019 Pro League, where he reportedly receives about $75,000 in contracts per year. This week’s Mythic Invitational tournament at PAX East in Boston, which Wizards of the Coast describes as the “biggest Magic: The Gathering event of all time,” would have been a huge opportunity for Turtenwald, so his thousands of Twitch followers spammed Reddit, Twitter, and Magic forums looking for answers in the wake of a brief tweet from Wizards Of The Coast announcing his removal. Apart from that tweet, the publisher has maintained total radio silence on the decision and did not respond to multiple requests for comment from Kotaku. Louke is one of three people who told Kotaku that Turtenwald has exhibited a pattern of predatory behavior toward female Magic players that spans several years. Screenshots shared with Kotaku showed that, Turtenwald continued pursuing these women sexually and romantically even after they stopped responding or turned him down. The Magic: The Gathering Mythic Invitational tournament at PAX East in Boston this weekend. “A lot of women in the community have warned other women about Owen,” Louke told Kotaku via phone on Thursday. Louke says that she has had a complex relationship with Turtenwald. It was briefly romantic, she said, but after that ended, he continually made her feel uncomfortable both physically and verbally at hang-outs in real life and over text messages. She says he asked her for nudes, persistently messaged her while drunk after she stopped responding, and once said that her looks distracted him during a tournament. Turtenwald, he said, would offer to help women advance as pro players, later implying it would be in exchange for what the source described as “wink-wink.” The man has not gone public with these statements, he said, because of Turtenwald’s fame and power in the Magic community. “He is a hall of fame member, somebody who was sponsored by Wizards of the Coast, one of the greatest players of all time,” he said. The Mythic Invitational is running through Sunday, and Turtenwald’s place in the brackets has been filled by player Brian David-Marshall.